This gland is located in the submucosa of the esophagus. . 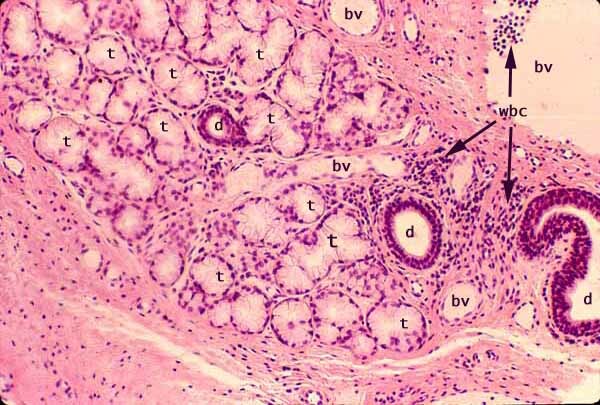 The gland consists of many tubules ( t ), lined by mucous epithelial cells, with an associated ducts ( d ). In each tubule, the lumen is centrally located and clear. These many tubules are all interconnected with one another and with the duct. Some tubule branching is evident in the micrograph. In each mucous cell, the cytoplasm is packed with stored mucus (giving a relatively clear appearance) and the nucleus is displaced toward the base of the cell (i.e., the periphery of the tubule). has relatively clear apical cytoplasm (where the mucus is stored). Associated with the gland are several blood vessels ( bv ). White blood cells ( wbc ) in a blood vessel and in circumvascular connective tissue suggest a mild (and very localized) inflammatory infiltrate.